This 2-hour module presents the fundamental principles of Doppler weather radar operation and how to interpret common weather phenomena using radar imagery. This is accomplished via conceptual animations and many interactive radar examples in which the user can practice interpreting both radar reflectivity and radar velocity imagery. Although intended as an accelerated introduction to understanding and using basic Doppler weather radar products, the module can also serve as an excellent refresher for more experienced users. I was decent at knowing what I am looking at on radar before this lesson. This helps explain the why I am looking at what I am looking at. the videos and slides are easy to understand. The pictures with explanations help in retaining the material delivered in the session. Good job. This lesson is very useful for forecasting work. Fantastic Study Module. Very good conceptual explanations. Some of the storm pictures need to be enlarged to show more detail for the test. I like that you can retake the quiz as many times as you want because the more I correct my answers I learn and remembered what I learned. Very good content and well presented. The lesson descriptions is accurate: this provides fundamentals that are useful as a basis or as a refresher. The course could be improved if there were a way to provide more interpretation of images and feedback, or if there were a subsequent course that dealt with more indepth interpretation. Good course overall - would recommend to others. This lesson was interesting and useful. The lesson increased my understanding of the topics presented. 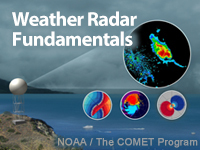 Great overview of weather radar fundamentals. too many multiple answers for the test questions. Helped further my knowledge of storm prediction and tracking. Great information on building upon rudimentarly understanding of radar interpretation. Won't prepare you to go out and chase tornados, but will give you a good foundation for future learning, and will help you understand what you're seeing when you look at any of those NOAA\NWS maps. Well presented, easy to understand and informative. Kept my intrest. Excellent refresher course on radar basics! Love the videos. Very easy for someone who is a visual learner. The lesssons are very very good! After more than 20 minutes of waiting, question 14 never loaded. I reloaded the page multiple times and question 13 would load I would click next it would stay on 13 I would click next again and it would go to 15. I would click previous and it would stay on 15 and I would click previous again and it would go to 13. Ultimately I just submitted it as is, without 14. This was my first MetEd quiz in a very long time and I was a little disappointed by it because of this. Great lesson to get the basic understanding of weather radar. I like to do weather and help out . It is tailored specifically to PPI scanning radars over the vertical scanning radars which would of also been useful. It was nice to have context using real world radars from the US but the variations in radar usage and design would of been nice especially from the UK for instance. Good lesson overall. I would have liked more exposure to a wider variety of real world examples and less idealized examples. Some of the images are hard to read because they are small. Also, after the lesson is finished it's hard to go back and review certain sections because the location of the content is somewhat obscured. Excellent as an introduction to radar forecasting. Excellent course - up-to-date information. The test is catigorized well, but having the exact same pic with 2 different answers was tricky, if ones wrong their both wrong. Most was fairly common sense though. I would recommend this course for any radar user. So confusing. Not nearly enough detail about quiz material and a ton of detail about unrelated info. Winds are from a direction and yet this quiz made that so concept so frustrating that I focused on that for way too long. The whole chapter contained alot of material which take one thinking before grasping and understanding the concept. Was great , learned a lot. A superb module!! Easy to understand but the pace of the presenter in some areas were a little too fast. Still, the module is one of the best. If you get a little confused, the ability to go back and go over it again makes it an easy fix. Plenty of audio and flash compared to some of the other modules. Actually enjoyed learning via this module. Easy to follow, and has great information for any aspiring meteorologist to learn. Very well done and easy to follow, but with good intellectual content. I learned a lot. The quiz is particularly good, covering actual applications of the material in the module. Fantastic course. Excellent material however the narrator set the pace far to fast. Her flow is good and easy to understand but get ready to pause it moves very fast. I would like to see an additional or higher level course for this. As far as educational value it is the best course I have taken thus far. It is a challenge but you will learn a lot. This mod covers a wide range of radar topics in an easy to understand way. It can be viewed in short segments which allows it to fit into a busy schedule. This has been the most useful and interesting module I've taken so far. I'll probably end up looking at it again. Very good module, very easy to understand. Incredible, as always! But please fix problem with some photos/loops not showing on the iPad. February 2017: HTML and media assets in this lesson have been updated for current browsers and mobile devices.